Listen to both versions. The Piano and Orchestra edition is equally as beautiful. This work is my Opus Magnum, my War Horse. It took me a good thirty years of glorious effort to polish it into what it is now. It is a testament of my Romantic Spirit! (c) 1991 (p) 2000 All Rights Reserved. 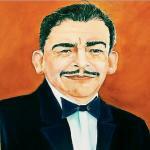 Álvaro Guevara y Vázquez, Composer,B.M.I. Performed on my Technics SX PR 51 with 9 Ft. Hamburg Steinway Grand Piano Digital Sample. My warmest regards, thank you for listening. Álvaro Guevara y Vázquez, Composer- Concert Pianist. Send me your comments,I would love to hear from you. Publisher Credits Grupo G.E.M.A. Àmeríca, Álvaro Guevara y Vázquez, Publisher, B.M.I.